Eastbourne Borough lifted the Parafix Sussex Senior Cup for the third time in their history with a 1-0 win over Worthing at the Amex Stadium this evening. Nathaniel Pinney, who was sent off in the closing stages, got the only goal seven minutes into the second half but Borough were made to work hard for their victory against a Worthing side who created several chances during the 90 minutes. 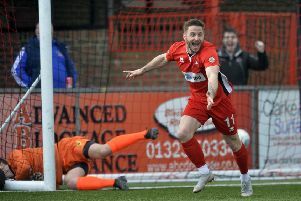 Worthing went into the game looking to complete the double after promotion through the Ryman League South Division play-offs. They were were without 29-goal top-scorer Lloyd Dawes and Brighton & Hove Albion loanee Jordan Maguire-Drew, who netted eight goals in six games for the club, but had the better of the chances in the first half against their National South opponents. Rebels had the first opening on seven minutes when Omar Bugiel beautifully controlled a long ball forward and laid it inside to Ben Pope, whose shot from 15 yards was turned past the far post by Borough keeper Lewis Carey. Worthing went even closer five minutes later when Zach Newton broke down the right and sent in a low cross for Bugiel, who saw a powerful strike from eight yards superby kept out by Carey. Borough had a couple of efforts from distance blocked, before Jack Evans worked a free kick across field to Ryan Worrall but his blistering drive from 25 yards flew just over on 21 minutes. Worrall had an even better chance four minutes later when Rebels keeper Jack Fagan could only claw a Jamie Taylor right-wing cross as far as the Borough midfielder but he side-footed over from ten yards. Carey again denied Rebels on 31 minutes when Brannon O’Neill curled a free kick over the wall but Borough’s keeper was down well to push the ball to safety. O’Neill fired wide from 22 yards moments later, before Rebels had another excellent opening on 40 minutes. Borough left-back Gavin McCallum got back just in time to deny Newton but the ball went only as far as Pope and he blazed over from 14 yards. Rebels made a bright start to the second half as Harvey Sparks’ low centre was turned behind by Borough defender Callum Buckley, under pressure from Pope. Worrall curled a shot wide from 25 yards at the other end, before Borough took the lead on 52 minutes. Top-scorer Pinney skipped past Gary Elphick as he burst into the penalty area and squeezed the ball home from a tight angle. Rebels’ O’Neill had a inswinging corner pushed away from on the goal-line by Carey on 57 minutes and Bugiel could not quite then stretch enough to turn home Pope’s cross at the far post two minutes later. Borough captain Ian Simpemba brilliantly got back to deny Bugiel on 67 minutes just as the Rebels forward was going to pull the trigger, while Eastbourne almost doubled their lead a minute later when Evans’ low strike was deflected just the wrong side of the post after excellent work by Pinney. O’Neill had another low free kick saved by Carey on 72 minutes as Rebels continued to create chances. Another glorious chance came and went on 77 minutes when Pope was unable to turn home Newton’s cross from just a couple of yards out. Pinney lobbed over as Borough hunted a second on 79 minutes when Evans dispossessed Corey Heath. Rebels pushed for a leveller in the closing stages but Borough held on to win in front of a crowd of 2,899, despite Pinney seeing red for a second booking in the final minute. WORTHING: Fagan; Hendon, Elphick, Heath, Metcalf; Newton, O’Neill, Axell, Sparks (Waller 86); Bugiel, Pope. Subs: Banks, Quirke, Edwards, Piper. EASTBOURNE BOROUGH: Carey; Stone, Evans (Sheppard 84), Worrall (Worthington 80), Simpemba, Buckley, McCallum, Collier, Pinney, Taylor (Haysman 86), Romain. Subs: Baptista, Beale.